Stacey and Jenny came over for dinner again tonight. I am so lucky to have friends who are willing to be my guinea pigs for new recipes, even when they are eating things they have never had before. 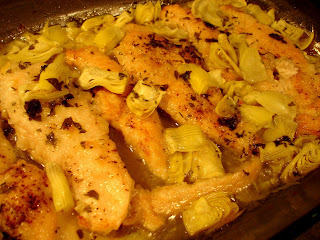 Tonight I made a chicken dish baked with artichokes and thyme in white wine-lemon sauce. I also made mashed cauliflower (great substitute for mashed potatoes) and roasted asparagus. Here is the recipe for the chicken. I read a few recipes for inspiration and ideas and then made up my own. This chicken was great - very fresh and light tasting. I'll definitely make it again. I served it with mashed cauliflower and roasted asparagus. Looking forward to leftovers for lunch tomorrow! I posted about this dish's awesomeness when you first posted you were going to make it. But it looks even BETTER now that you made it! 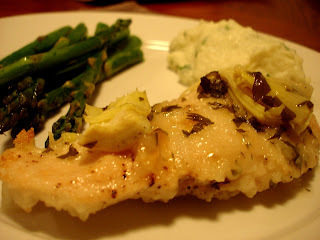 I have been looking to make chicken with artichokes for a while now. I will have to try this. you're so creative! this looks great. We made this a few weeks ago and LOVED it! It will definitely be in the rotation in the future! Thanks for the inspiration!